"U.S. Social Security Applications and Claims Index, 1936–2007", database, Ancestry.com, "Sackett, Elton Spencer, b. Winnebago, Minnesota, 11 Nov 1918, d. 22 Jun 2003, father Elihu E Sackett, mother Amy F Maine. Listed Jun 1937 as Elton Spencer Sackett. Listed 2 Jul 2003 as Elton S Sackett." US Social Security Administration, "Social Security Death Index", database, American Ancestors, "Elton S Sackett, b. Nov 11, 1918, d. Jun 22, 2003, SSN 475-09-5309 issued MN, residence Waunakee, Wisconsin, 53597, county Dane." "Tennessee, County Marriages, 1790–1950", digital image, FamilySearch, "Davidson, Tennessee, m. 11 Dec 1942, Elton S Sackett, 24; to Laura Joan Schlicht, 28; both of Crossville." "Wisconsin Divorce Index, 1965–1984", database, FamilySearch, "Laura J Sackett, 5 Dec 1977, La Crosse, Wisconsin, age 63, husband's age 59." "Wisconsin, Marriage Index, 1973–1997", digital image, Ancestry.com, "Dane County, Wisconsin, 10 Jun 1978, Elton S Sackett, 59, of Dane County; to ___ Merrill, 55, of Dane County." "U.S., Cemetery and Funeral Home Collection, 1847–2018", database, Ancestry.com, "Edan [sic: Edna] Sackett, 88, b. 22 Apr 1923, b. 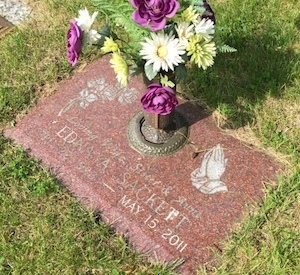 New Liepzip [sic: New Leipzig], Towner, North Dakota, d. 15 May 2011, obituary 17 May 2011, Wisconsin, parent Gottlieb Peltz, siblings: John, Elsie, Roland, Vic, Harold, Hilda, and Esther." "Social Security Death Index", database, Ancestry.com, "Edna A Sackett, b. 22 Apr 1923, d. 15 May 2011, SSN issued Nebraska before 1951, res. 53558 McFarland, Dane, Wisconsin." Sackett, Elton, son, 1 1/12, b. MN, father b. MN, mother b. MN. "U.S. WWII Draft Cards Young Men, 1940–1947", database, Ancestry.com, "Elton Spencer Sackett, age 21, b. Winnebago, Faribault, Minnesota, 11 Nov 1918, res. Winnebago, wt 175, complexion light, eyes brown, hair red, ht 5' 10", nok Ina Maine, reg. 16 Oct 1940." "US Department of Veterans Affairs BIRLS Death File", database, Ancestry.com, "Sackett, Elton, b. 11 Nov 1918, d. 22 Jun 2003, branch Army, enlisted 25 Oct 1940, released 12 Oct 1945." "US World War II Army Enlistment Records, 1938–1946", database, Ancestry.com, "Sackett, Elton S, b. Minnesota, 1918, enlisted 25 Oct 1940, at Mankato, Minnesota, branch Infantry, Private, Panama Canal Department, educ 4 yrs High School, civil occ cook, single without dependents, ht 68, wt 160."